The programme is run in a way similar to many Horizon 2020 projects with the work divided up into individual Work Packages (WPs). The organisation takes care of the GeoERA programme for the whole 5 year duration of the programme. The main decision making body is the General Assembly in which all partners are represented. Monitoring the overall progress of, and coordination between, the transnational projects funded through the call. TNO makes available a Project Assistant, a Legal Officer and a Financial Officer, who supports the Project Coordinator with executive management tasks. The Project Assistants supports the preparation of meetings, reports, etc. Accounting, ensuring compliance of all budgets and cash flow is the responsibility of the Financial Officer. All legal issues concerning among others contracts and agreements is the responsibility of the Legal Officer. TNO – Program management: Coordinator: Tessa Witteman and Assistant: Kim Nathalia. BGR – Preparation and launch of the Calls: Jörg-Uwe Damm and Antje Wittenberg. GEUS – Evaluation and proposal selection for the Calls and Communication and Dissemination: Lisbeth Flindt Jørgensen,Kirsten Bache and Jørgen Tulstrup. GeoZS – Monitoring of Funded Projects: Barbara Simić and Jasna Šinigoj. EuroGeoSurveys – Communication and Dissemination: Patrick Wall. NWO – Submission system for the Calls: Bernard Westerop, Hayfaa Abdul Aziz and Marc de Jonge. WP1: Management. Leader: Tessa Witteman, TNO. WP2: Preparation and launch of the co-funded call: Leader: Jörg-Uwe Dam, BGR. WP3: Evaluation and proposal selection for the co-funded call: Leader: Lisbeth Flindt Jørgensen, GEUS. 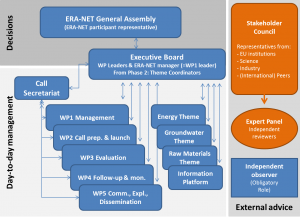 WP4: Follow-up and monitoring of project results from the co-funded call. Leader: Jasna Šinigoj, GeoZS. WP5: Communication, Exploitation and Dissemination of the results. Leader: Jørgen Tulstrup*, GEUS. All WP Leaders have a seat in the Executive Board to ensure direct communication lines between the WP’s. *) Jørgen Tulstrup does not take part in any Executive Board decision concerning the evaluation and selection of the Information Platform project ideas and proposals. Information Platform: Jørgen Tulstrup, GEUS. Read more about the TCs here. Dissemination of GeoERA findings beyond the consortium. The SC members may also be member of the Expert Panel. Dominique Darmendrail, representing Water JPI. The Expert Panel is the pool of external reviewers that will review the Stage 2 proposals. Expert Panel members will be proposed by the EB. Final approval of the EP membership is done by the GA. The composition of the Expert Panel should reflect the diversity of Stakeholders of GeoERA and include representatives from EU research organisations, international peer organisations and science, industry and policy sectors. It should also cover the expertise of all four topics addressed by GeoERA. In selecting the Expert Panel members, care will be taken to avoid any conflicts of interest. Preparation of the independent observers’ report ((part of) Deliverable 3.5). The Independent Observer is Duncan Jarvis of EMPIR.